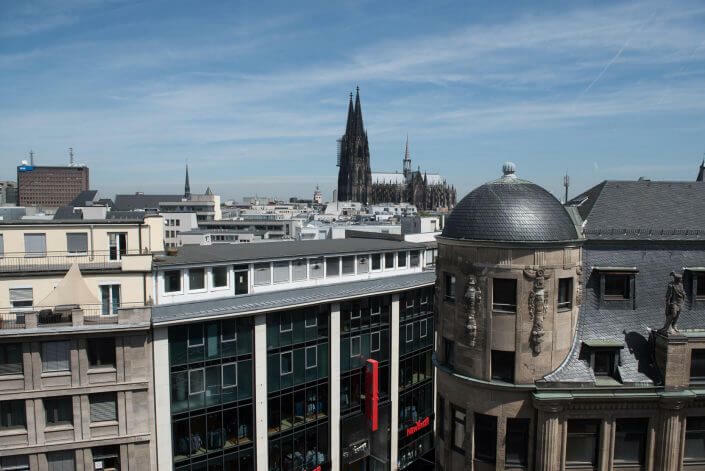 Finally getting the entire Dom in the photograph – how else would this be possible if not from a bird’s eye perspective? The view of Cologne from above is breathtaking. From a certain altitude visitors can get a great initial impression of the city, yet even Colonians will appreciate a different perspective of the buildings, quarters and landmarks that they couldn’t get from street level. I’ve put together five of the best vantage points across the city. Vertigo sufferers beware – not all of them will be suitable! 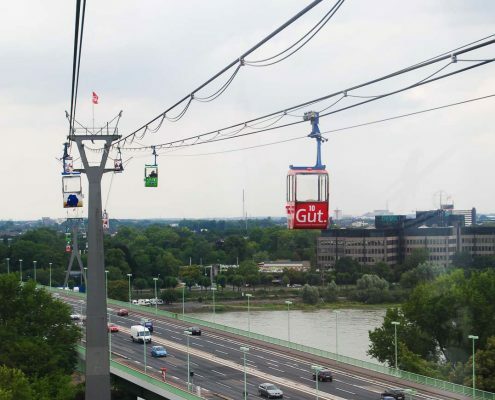 Since it was built almost 60 years, the cable car has transported millions of tourists and Cologne natives safely across the Rhine. 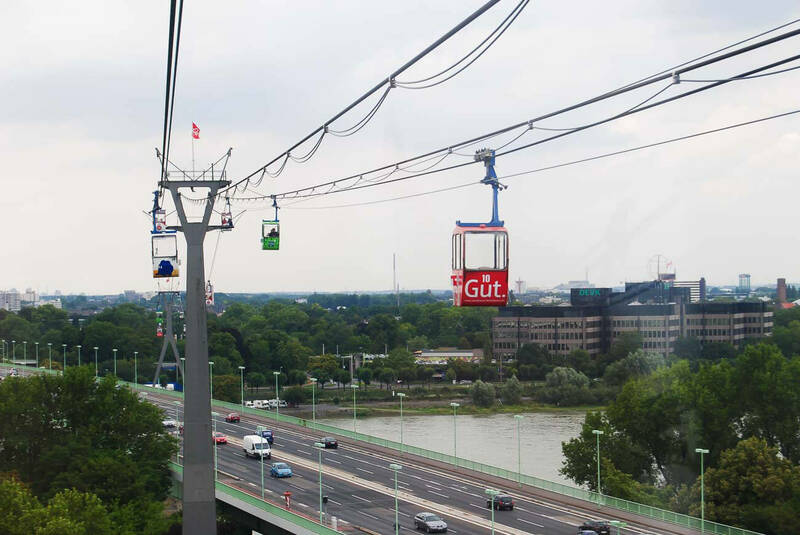 The gondolas traverse both the river and the busy Zoobrücke bridge – an exciting sight for drivers and cable car passengers alike. Boarding the cable car from the east bank of the Rhine, you’re taken directly to the zoo. Conveniently, combined admission tickets for cable car plus zoo can be bought on departure. 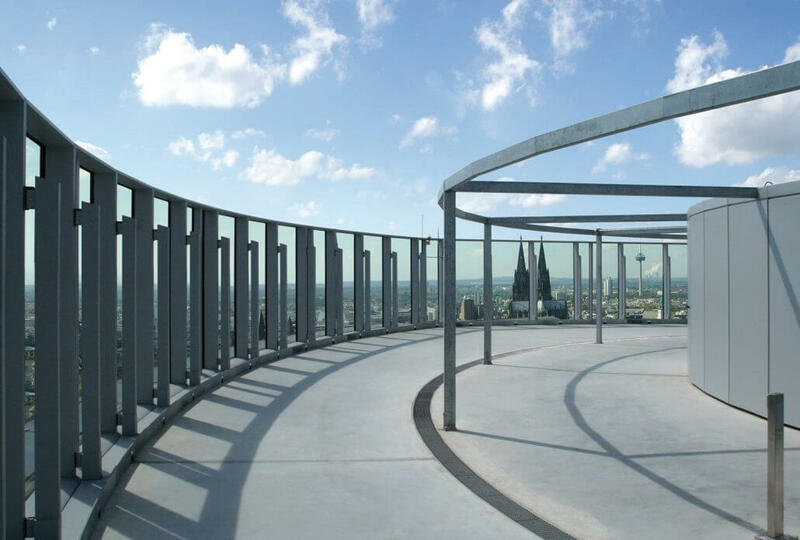 The panorama platform on top of the high-rise KölnTriangle offers what is probably one of the most stunning views over the city. At an altitude of over 100 metres visitors enjoy a 360-degree panorama of the city, the Dom, the Rhine and the bridges over the river. Through thick glass walls, photographers can safely capture the to-and-fro at ground level. The platform is reachable via a lift, with one short set of steps to go until the very top. It’s both child-safe and child-friendly, with free admission for under-12s. If you’re planning to combine culture with stunning views, you’d better be wearing your comfiest shoes. The good news? 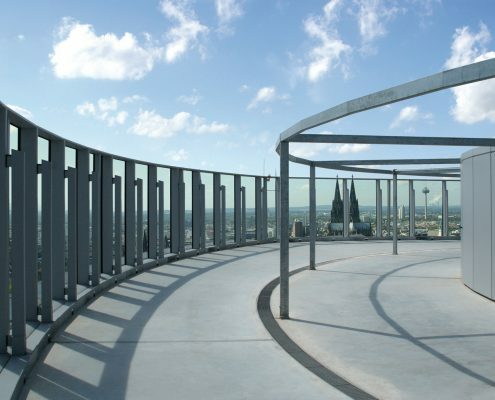 One of the best vantage points in the city is the viewing platform on the south tower of the Dom. The not so good news? You have to climb 533 steps up a narrow spiral staircase to get there, because this being an ancient Gothic cathedral of course there’s no public lift. 53 metres and 240 steps up you pass the belfry, home to the largest freely suspended church bell in the world – St Peter’s Bell, lovingly termed “d’r decke Pitter” (Fat Pete) by locals. Guided tours of the belfry are offered, but you should book ahead. Once the intrepid climber has arrived at the top, panting and breathless – an experience in its own right – they are rewarded with gorgeous views that stretch all the way to the Seven Hills south of Bonn, weather permitting. Architecturally speaking, the Kaufhof parking structure number 1 on Cäcilienstrasse is a real relic from the 1950s. 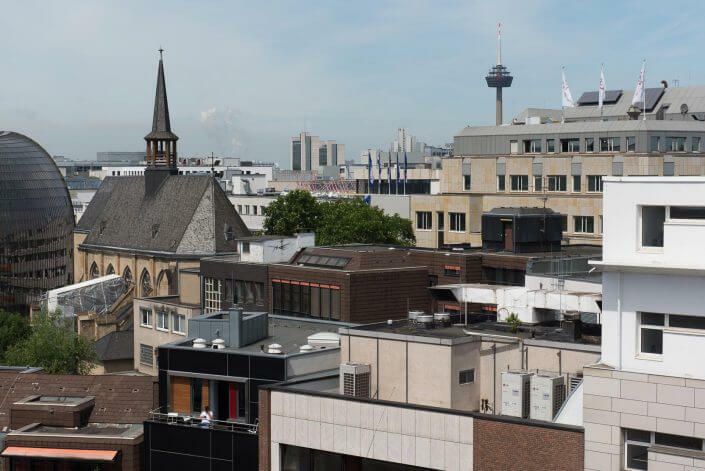 But its sixth and top floor, which is open to the elements, offers what is probably the most “urban” view of the city right in the heart of Cologne. This viewpoint offers stunning panoramic views of the rarely appreciated southern prospect of the Dom, as well as of the Crane houses high-rises, Severinsbrücke bridge, Antoniter church and Cologne’s TV tower. This is a fairly quiet viewpoint because drivers rarely have to ascend all the way up the narrow winding ramp to the sixth floor to find a vacant spot. If you’re planning to go up on foot, you’re advised to use the “An St. Agatha” entrance and follow the sign “Aufgang Parkhaus”. 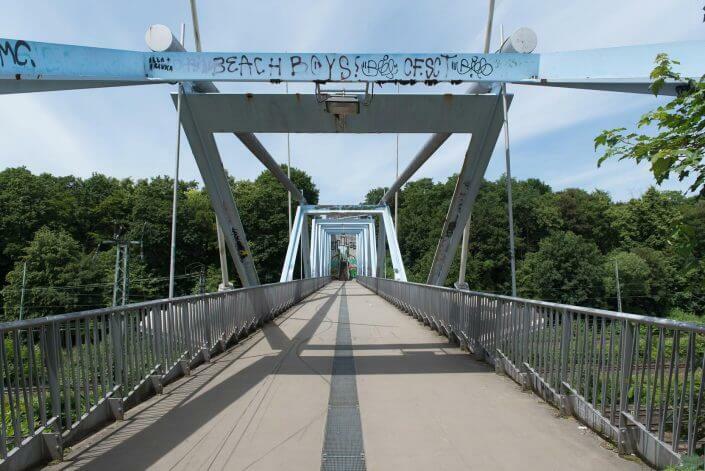 The pedestrian bridge links Mediapark with Innerer Grüngürtel park and is hidden away right in the centre of the park– a nameless but aphotogenic, slightly old-fashioned footbridge, easy to spot thanks to its faded blue steel girders. From here pedestrians have a lovely urban view of the Dom, the TV tower and the train tracks on the embankment. The trains pass by below, while the paint peels off the graffiti‘d bridge overhead – an interesting contrast that makes this a great photo spot. Herculesberg hill, or “Monte Klamotte”, is right nearby, a climbable mound of rubble from World War II, now covered in vegetation. 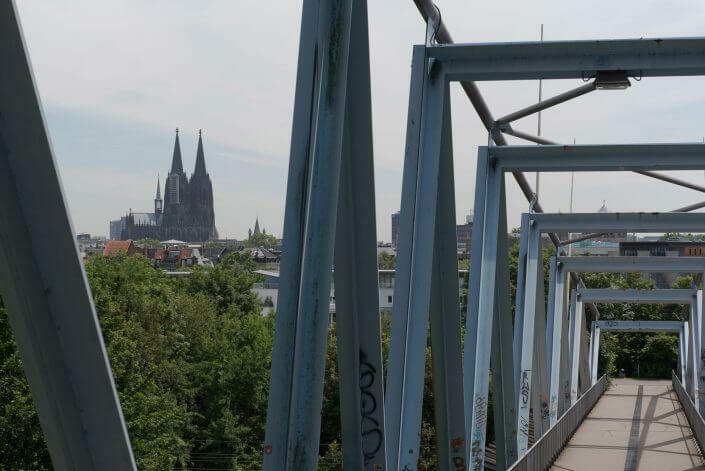 Just one more reason to bring a picnic basket and enjoy a slightly different view of the Dom. Thanks for the ideas. The Cologne cathedral is the good place for me. Great tips! As I have a small baby, I need to find a safe place and that suits a pushchair. Decided to try the KölnTriangle! Let’s see how we go!